!!!IMPORTANT!!! THIS BLOG HAS MOVED! HURRAY! YOU CAN FIND AN UPDATED VERSION OF THIS MOST BY CLICKING HERE! THANKS FRIENDS! 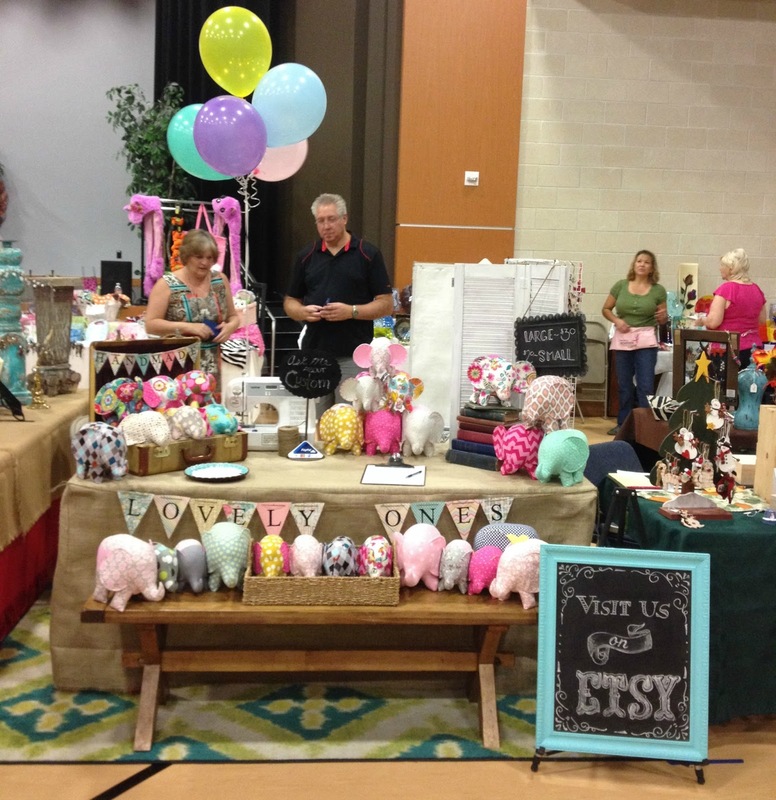 So I got up the guts to do my first craft fair! It went wonderful! There are a few things that I learned and I wanted to share with you so you can be successful as well! Below you will find unique ideas as well as some tips on what to bring. I would love to hear your ideas as well! #1. A NICE RUG- For some reason I haven't seen this tip anywhere online. Most fairs I have been to, including this one, took place in a gym. Now it may be just me but my display did not go well with the ugly gym floor. So what did I do? I brought my living room rug! This made my display look super homey and it also did the job of anchoring everything down and giving the display a more coherent look. It says "Come in and make yourself comfortable". #2. BRING A BENCH- I was limited to the space that I paid for. My space was 8' X 4'. Now considering my table took up most of the space, I needed another surface to be narrow enough to display more items. I borrowed the bench from my friend to display more elephants! This also worked great because children could easily see my product. This is the same tactic grocery stores use to sell the sugary cereal; to display it on kid level. This is a great tool if you want more dimension. #3. DISPLAY YOUR CRAFTING TOOLS- This is a great tip because it accomplishes so much. First, it is super cheap to display what you already have. In my case I was broke and needed to take up more space on my table with décor. Second, it lets the customer tangibly see that I actually do sew my own product and makes it more personal seeing the machine on which their purchase was made. I was planning on bringing a bunch of my fabric (folded nicely) as well, but forgot. For example, If you crochet, display some yarn balls and hooks. #4. CUTE AND EASY BUSINESS CARD DISPLAY- The easiest way, a pretty ceramic plate! I had this brilliant blue plate in my cupboard forever but had never used it. Another cute idea is to super glue a pretty thrift store wine glass or teacup upside down to the bottom to make a little "serving tray". I would have done this but ran out of time. Check out this sweet tutorial. BONUS TIP from my supportive husband: spread your cards out, they are easier to grab and will make a possible customer want to grab them. This actually worked as I almost ran out of my 250 business cards. #5. VERTICAL HEIGHT- This tip is very important. Vertical height creates interest. You can use a lot of things to make it. In my case I wanted to keep the shabby chic theme, so I found this old hinged shutter at a Mini Mall antique place. It was an ugly brown so I gave it a few quick coats of white paint making sure to keep it uneven. This also served another purpose, to hide the tall backside of the booth behind me (my moms). Chances are the booth behind you is going to have a beautiful front and an ugly back. Just make sure you do your best to counter act it. #6. CHALKBOARDS- I'm sure you have seen this tip before but I wanted to tell you what I did differently. I didn't use chalk boards for prices (mainly because I didn't have so many things) I just listed the prices on one chalkboard for easy reference. The trick here is to use a few different style boards in different ways. For example, one hanging from my vertical piece, one standing on the table letting customers know that I do custom work and one big one in a bright frame letting people passing know that I have an Etsy shop. The last is super important because if you know what Etsy is, you will know that this seller means business and will (hopefully) conduct themselves professionally! #7. "HANDMADE" SIGN- Have you ever seen a booth and wondered if what they are selling is even handmade? I see some things that definitely don't but I know those are the rules of all craft fairs. I love the idea of a sign letting people know that what you are making is definitely handmade! It is just another little piece that makes your table more interesting! #8. BOOKS- There is nothing more whimsical than a book. Books suggest knowledge, adventure and curiosity. Why not harness that power? I chose to use vintage and antique books stacked up to echo my vertical line. These my mother already had so I was able to do this for free. Pick some books that speak to your product line. Children's books, philosophical books, old books? Either way this tip is great for those on a budget. Check out your local Half Price Books. #9. BALLOONS- This tip came to me the day before they show. I wanted something to stick up high enough that it would cause people (especially children) across the space to say "Ooo, lets go see what's over there!" These 5 balloons at Party City only cost me $5! Just make sure that you remove the little clasp that holds the balloons together at the top, which I clearly didn't remember to do right away. Only do this tip if the balloons go with your theme. Warning: you may get asked for a balloon, which I loving gave to the sweet little girl that asked me. #10. CONSTANTLY REARRANGE YOUR PRODUCT- I am surprised I haven't heard this tip before. So you love the way your product looks right? Well people only see things a certain way. Notice that something isn't selling? Or maybe something cant be seen at all? Pay attention to where people are looking and rearrange as you sell product to give everything in your booth a chance. BONUS #11. BRING A FRIEND- Craft fairs are usually very long. Mine was 9am to 4pm. This doesn't count getting there early to set up and staying late to break down. Make sure you bring a friend with you so you can take a break. Chances are you will have to go to the bathroom or eat something. Don't leave your booth unattended as you will most likely miss a sale! I asked my sister to come for a few hours in the middle of the day to help as backup. Just make sure they are versed on your product. She even made a few sales! There you go! I hope these tips can help you to have a wonderful and successful experience! What would you add to this list? Lets make sure we support each other and give the best advice we can! Crafters Unite! Like what you see? Vote for my blog by clicking below :) Please and thank you! Thank you! I'm glad you enjoyed the tips! 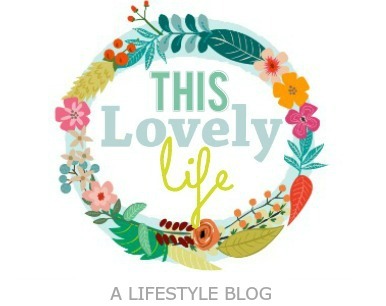 I just checked out your blog, super cute!! You take wonderful photographs! Some of the best tips I have read regarding booth set-up and design!! Thank you so much...love your pieces!! Awesome tips and tricks. Thanks for sharing.